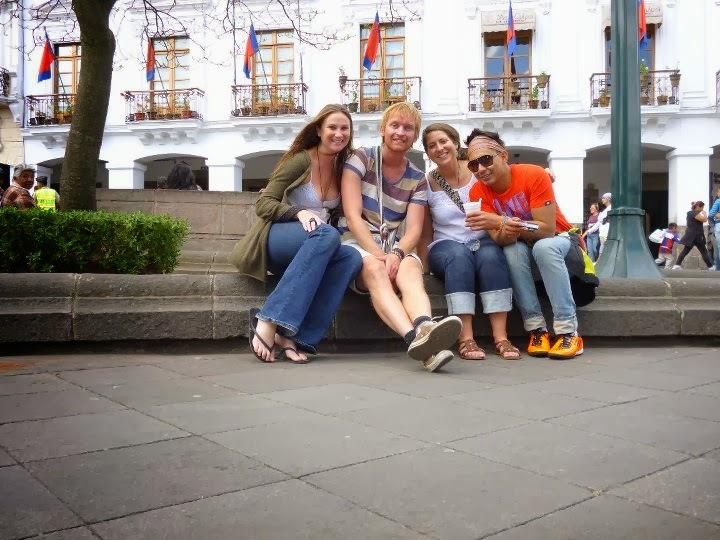 When I first landed in Quito, my legs were shaky. The airplane was unable to touch ground due to strong winds above the city, so we flew South to Guayaquil to get fuel and sit in the runway... and wait. At midnight on September 2nd, three hours after my scheduled arrival, I walked alone through the crowds in the Quito airport. Spanish conversations buzzed around me, but I couldn't seem to recall a single phrase I had learned in the previous weeks. I needed to take a taxi to find a hostel in La Mariscal District (A.K.A. Gringolandia), but thoughts ran through my head of dangerous cab drivers and petty crimes in the city. A woman working the desk recommended the taxi of one older man, so I hopped in his van and trusted he would take me where I asked. While we drove through the desolate city, I sat clutching my backpack and attempting to swallow the knot that was forming in my throat. I couldn't help but question why I had chosen to move to this unfamiliar country where I had no friends and could barely speak the language. I had never felt so alone. A combination of jet lag, frustration with my Spanish and a bit of confusion made me want to curl up in that backseat and cry. It took complete concentration to hold in the tears and convince myself that these uncomfortable situations help you to grow into a stronger person. So, I sucked it up, checked into a hostel and fell asleep in the top bunk of a room full of strangers. $7 for a bed, a warm shower and free breakfast. The next morning I staggered down to the dining room for toast and cereal with several other sleepy backpackers. The good thing about travelers is we are naturally curious people -- Why else would we want to see the world other than to satisfy scratching the itch of curiosity? And quick friends are easy to make when staying in hostels. Everyone has their own unique stories to share of where they've been, what they've done and of course where they're going. So conversations at breakfast naturally flowed and initial plans for a walk in the park with some Ecuadorians also led to a trip to the outdoor market, sharing a burrito with an Australian girl, cervezas and broken Spanish around a patio table, failed attempts at salsa dancing and a secret after-party at an underground diskoteka. 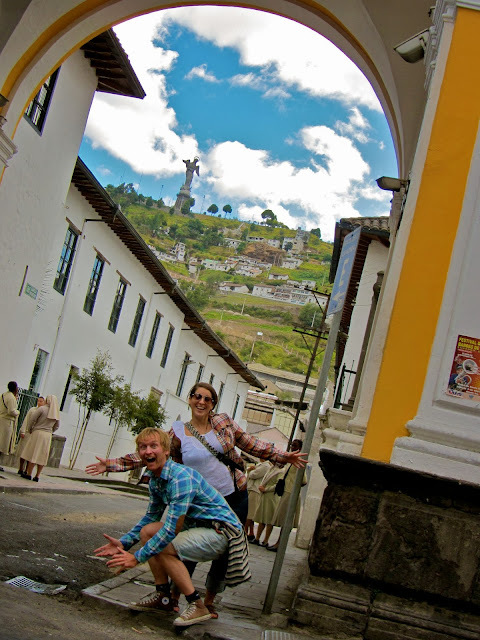 Quito is a mix of the old and new cultures of Ecuador. La Mariscal district is full of young people, hostels, modern restaurants and bars, while the old town has colorful plazas, rows of old buildings and historic churches watched over by El Panecillo, the virgin angel statue. Along the street, little boys with dirt on their faces want to shine your shoes for a quarter and young girls selling Chicklets look up at you with sad brown eyes. It's not easy saying no. After spending a week in the capital city, I was able to get somewhat accustomed to the Ecuadorian lifestyle and also register my visa. But seven days of commotion left me eager to get to the tranquillo atmosphere of the farm.